I’m not a coffee person (love the smell- don’t love the taste). Tea, however, is a hot beverage I can really get behind. This passion for tea translates into a tea box that just can’t accommodate my collection and a tea drawer that is jumbled at best (since there’s no room for all of the boxes that the tea comes in, most of the tea bags have been relocated to bags… it’s an adventure). This situation is totally fine for me; I usually know what I’m looking for and can just paw through to find it. It’s not great for hostessing, though, as guests don’t know what’s available (why the heck not, right?) and I don’t really love the idea of putting 15 ziploc bags full of various tea varieties on my counter every time people come over. Enter my newly crafted Tea Wreath. With this little circle of goodness, my guests can easily see each kind of tea I have without having to sift through my massive, and sort of confusing, collection. Then, when people leave, I just replenish the wreath. It’s both easy for me and great for all the tea drinkers that frequent our house. 1. Hot glue your two pieces of cardboard together (this is to give your base a little bulk since it’ll be holding a bunch of clothespins eventually). Cut the doubled up cardboard into a generally wreath-like shape (a circle, or if you’re adventurous, a square). Make sure the ‘wreath’ part is about as thick as a clothespin. I traced plates to make my circles (you can see that I didn’t like my first choice of inner circle and found something smaller to trace instead). 2. Cover your circle with patterned paper. I traced my ‘wreath’ onto the back side of the patterned paper and then cut outside of my lines by about half an inch to give myself gluing margin. I then notched the margin up to my tracing lines and glued the little tabs around the outside and inside circles. I’m sure there are other ways to cover a cardboard circle- that’s just what I did. 3. Cover your clothespins. You can either stick with patterned paper (I just cut long strips of paper about the width of the clothespin, hot glued the long strip on, and trimmed the ends), or cover with glitter or paint. You could even dye them! 4. Start hot gluing your clothespins to your wreath. Continue until the whole wreath is covered in evenly spaced clothespins. Make sure that the ‘mouth’ of the clothespin faces the outside of the wreath (otherwise you’ll have a whole jumble of tea bags in the center of the wreath and people won’t be able to see which kinds you have). 5. Tie a ribbon on your wreath for hanging. Clip tea onto each of your clothespins. Hang and enjoy! 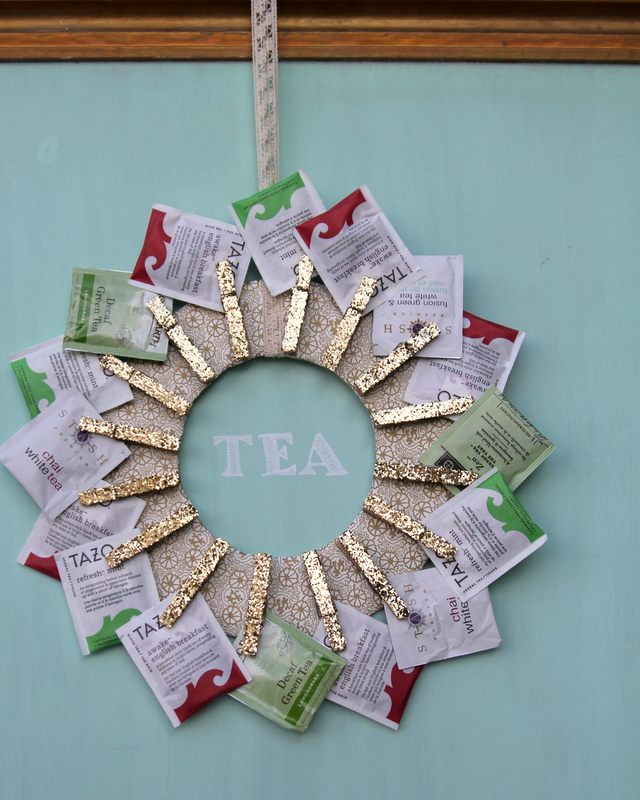 One of the best features of this tea wreath is it’s adaptability- see other variations here, and here. What a cute idea/craft for Girl Scouts to make for gifts…Christmas, Birthdays, Mothers Day, etc. It would be affordable and I am sure so very appreciated. Love it!! I love this! What an awesome idea…beautiful and functional as well. I featured it on my blog. I love this! I am a tea drinker too and can relate to the jumbled up mess of tea bags in the drawer. Thanks for the great idea and tutorial! What a cute idea. As a fellow tea lover, I understand. My tea chest is absolutely overflowing. Ok I seriously LOVE this and must make it NOW. What a great idea!!! What a novel idea… you put quite a bit of energy into this… the tea lovers might just use the tea bags so be careful…. love it! I thought that was the idea…to use & replace. That is such a cute idea! I've never seen anything like it. I'm a huge tea drinker, so I understand how crazy it can get with a million boxed stashed all over the kitchen. I love your solution! i am making one for myself!! What a fun gift idea! I love it! I would be replenishing it constantly…I love my teas! 🙂 Thanks for sharing! What a great idea! A useful wreath! Form and function. I love it! This is super cute! My wheels are spinning about where I could hang sucha thing in my kitchen…. hmmmm! This is an awesome idea. 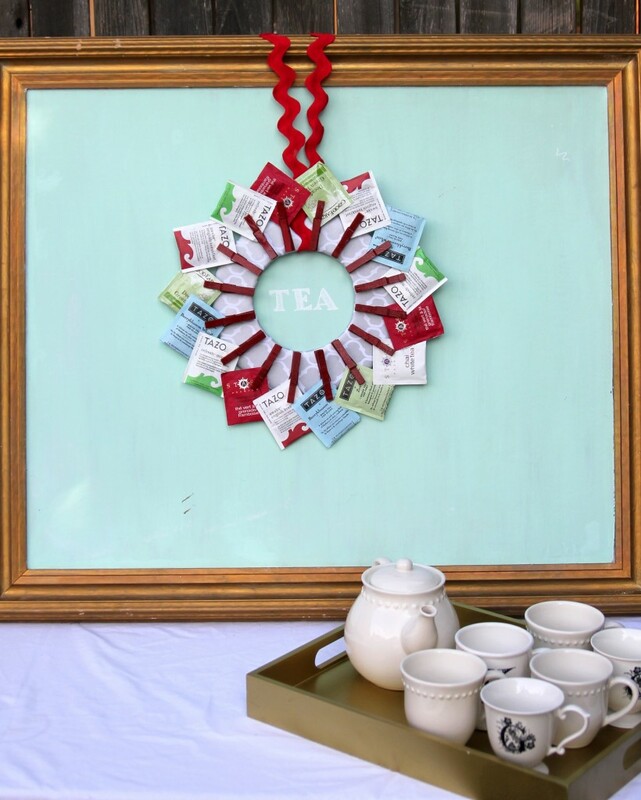 I definitely want to make this for my mom, an avid tea drinker. Cool! Seriously, I´ll do this. Today, I think! RIght now! Thanks for this idea! I love it, love it, love it! I'll be linking to this. This is the cutest idea I have seen in a while…Love it…would make a cute gift…or even to have on display during an afternoon tea. I'll be back to visit! I'm a tea or Chai person myself, and that shows in my blog's name, too! I love, LOVE, love this so beyond words! Just fabulous! Stopping by from LIFE AS LORIE! This is the most creative way to store your tea! Makes a nice display too. Thanks for sharing such a great idea. that is the cutest thing ever! we have tea around the world every tuesday! if you want to visit my blog i'll tell you how to join us! That rocks! I even love it without the tea bags!!! This is the first time I've EVER commented on a DIY and I've seen hundreds. Clever, whimsical, practical. Great! I love this idea! 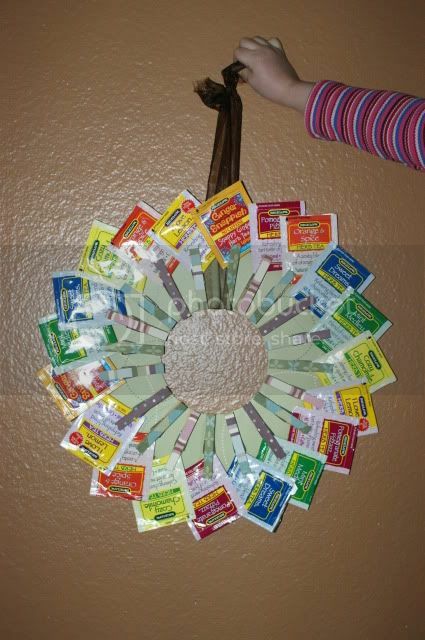 Also, don't forget to save the colorful packets after you drink the tea – you can make another wreath with them. See a tutorial on my blog at http://connectthedotscrafts.blogspot.com/2009/12/recycled-projects-tea-wreath-garland.html. this is so cute! I shared your idea on my blog today. This is adorable! I love how bright and cheery it is. Thanks for the turorial. wonderful! I am going to do this soon! I like ira's idea of using as a gift. I think it might also be a great prize at a bridal or baby shower. Even at a womens tea party. LOVE IT! thank you soooo much. I would spray paint the clothespins to make it even easier! Good idea except I need two wreaths for all my teas! Wonderful, very creative and useful idea! Thanks for sharing! Your blog is so fun to look at. I got stuck on it for quite awhile. Thanks for all the inspiration! Thank you so much for this idea. I have a dear friend that, sadly, spends too much time in the hospital with her youngest child. I'm going to make one of these for her to take on those trips. Not only will it decorate the room, but it will give her access to tea any time she wants it. You've got me smiling! This is such a great idea! Thanks so much for linking up at craft schooling Sunday! I'll be sharing this with my readers this week and hope to see you again too! all the best and thanks for all the wonderful projects! I love this! I keep my tea bags in a cute ceramic bowl so I can pull it out for company, but this would be awesome! Thanks! I am a tea person too. This is such a clever and colorful way to store or display teabags. It would make such a nice gift too. This would make a creative and useful gift. I am have stumbled this so I will remember it. Great idea! I am so excited about this! I'm making it for my Secret Sister at MOPS for next Tuesday! But, shhh, don't tell! Well, I made mine. It's not as fabulous as yours, I think I needed a darker background paper. But, I do still really like it! LOVE it!!! My mom is a huge tea drinker! Thanks! I love this! It's very clever and would make an excellent Mother's Day gift! I'm going to try this soon. Thanks for the idea! I found this post through Infarrantly Creative's LOVES links! i have been thinking about this project since i saw it on craft schooling sundays at creativejewishmom.com. i just went out and bought a bunch of clothespins and i'm hoping to make it this week. i think it would make a really nice photo display as well. thanks for the idea! Just the idea of covering clothes pins in pretty paper is fantastic. I don't drink tea, but I can think of so many more uses for pretty clothes pins — clipping and displaying photos, notes, greeting cards, etc. Thanks so much for the idea! My herbal tea bags aren't individually wrapped like this but I immediately thought of Christmas cards! Perfect! I think this is a great idea for the teachers lounge at my kids' school! Love it!! Our tea packets are overflowing & this will be perfect. Thanks!! Lovely idea!!!! I hope you don´t mind if I featured it on my blog. Thanks so much for sharing this! I love it! Wow! I love this because 1. It's so cute and 2. I'm addicted to tea! Hello fabulous Christmas idea! Thanks for sharing your creativity! I don't know how I ended up at this post but I love this idea so much esp. for this time of year when we're looking for gift ideas! I will be making one of these asap for one of my dear friend! Thanks! Here is my version with a link to your tutorial! Thanks again for the great idea! Thanks for the Tutorial!! I Copied that! Great idea. Very beautiful and sweet. I made one of these for myself and liked it so much that I made 20 more for Christmas gifts. Thanks for the great idea, and the good instructions! Omg, I love this idea, awesome!! I love tea too! Brilliant! this is so cute and creative! Can't wait to see what else you have to share with us. Keep up the good work. OMG. I thought I was the only one with a tea drawer. It's a big one and I can't fit all my tea in it, either. Love the wreath! Love this idea. While it is a similar concept as the Christmas card holder I just put away, yours looks so much better. You could even make seasonal ones and change them every few months. Also, it's a great way to display those wallet size school photos! I believe I just found a great mother's day gift. How wonderful! The best part is this can be custom designed to match anyone's kitchen, such a great idea. Thanks for sharing your wonderful inspiration! Great idea! Something similar was on the early morning news today only she had put the pins towards the center which i did not like. This would be cute in Christmas paper to hold Christmas cards. I love this! Sou brasileira e achei o blog de vocês e adorei.Sempre vou dar uma olhadinha.Vocês têm muito bom gosto.Parabéns! I just saw this on The Kitchn. I absolutely love this idea. I'm going to try making one for my office cubicle wall. You are so clever! THANK YOU! After wanting to make this for about a month, I finally did this morning and I LOVE it! What a great idea! Thanks! Love this! I just bought some paper to make one for my SIL. Then I open my Good Housekeeping magazine and saw it published there. Good Housekeeping approved! Very cool indeed. I tried my hand at the tea wreath for a dear friend for Christmas. I think I nailed it :). Wish I could figure out how to post a pic here – I’m not usually good at homemade crafts so I’m very proud of it. Thank you for the instructions that were easy to follow! Katrina, I love this so much! I bet she loved it, too! 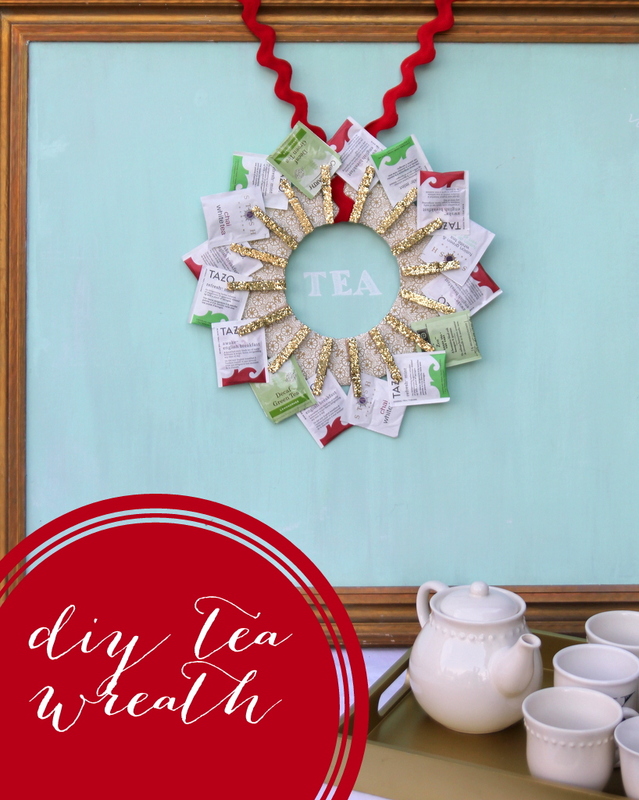 I love the tea bag wreath idea. I saw your wreath in the Good Housekeeping magazine. I cut out the section from the magazine and saved it so I could try my hand at it. I finally got a chance to make one. I gave it to my girlfriend for her birthday, We go to tea often so it was a perfect gift for her. The wreath turned out great and I think she loved it 🙂 Thanks for the awesome idea!! I am having a problem making the tea wreath, I think my paper is “too good”. I cannot get the tabs inside the circle, nor can I get a circle…What type of paper should I use…I am using a hallmark paper…Should I used a thinner paper? Hey Sally, I used a cardboard box for the circle (so fairly thick) and then just regular thin printed paper for the patterned paper. 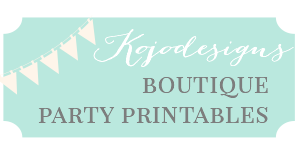 Perhaps if your patterned paper is nice and thick, that is the issue? I love it! I made a Tea Bag Christmas Tree, but I see how this one could be used for any season. Thanks for sharing! A Christmas Tree is such a great idea, Denise! Love it!